A phobia is an ongoing intense fear or anxiety of a certain object, animal, activity, or setting that poses little to no actual danger. Specific phobias are a type of anxiety disorder in which a person may feel extremely anxious or has a panic attack when exposed to the object of fear. Specific phobias are a common mental disorder. Being exposed to the feared object or even thinking about being exposed to it causes an anxiety reaction. This fear or anxiety is much stronger than the real threat. You may sweat excessively, have problems controlling your muscles or actions, or have a fast heart rate. You avoid settings in which you may come into contact with the feared object or animal. For example, you may avoid driving through tunnels, if tunnels are your phobia. This type of avoidance can interfere with your job and social life. The health care provider will ask about your history of phobia, and will get a description of the behavior from you, your family, or friends. The goal of treatment is to help you live your daily life without being impaired by your fears. The success of the treatment usually depends on how severe your phobia is. Cognitive behavioral therapy (CBT) helps you change the thoughts that cause your fear. Exposure-based treatment. This involves imagining parts of the phobia working from the least fearful to the most fearful. You may also be gradually exposed to your real-life fear to help you overcome it. Phobia clinics and group therapy, which help people deal with common phobias such as a fear of flying. Medicines called sedatives (or hypnotics) may also be prescribed. 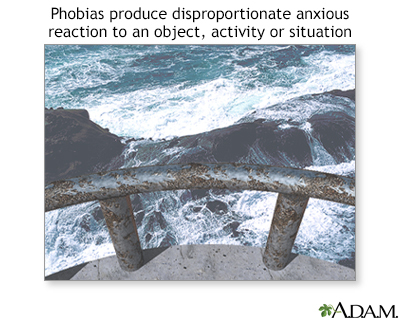 Phobias tend to be ongoing, but they can respond to treatment. Some phobias may affect job performance or social functioning. Some anti-anxiety medicines used to treat phobias may cause physical dependence. Call for an appointment with your provider if a phobia is interfering with life activities. Common simple phobias are those involving animals or insects, a fear of high places, a fear of lightning, a fear of flying, or other fears. These are very common in young children, and do not represent an abnormality.